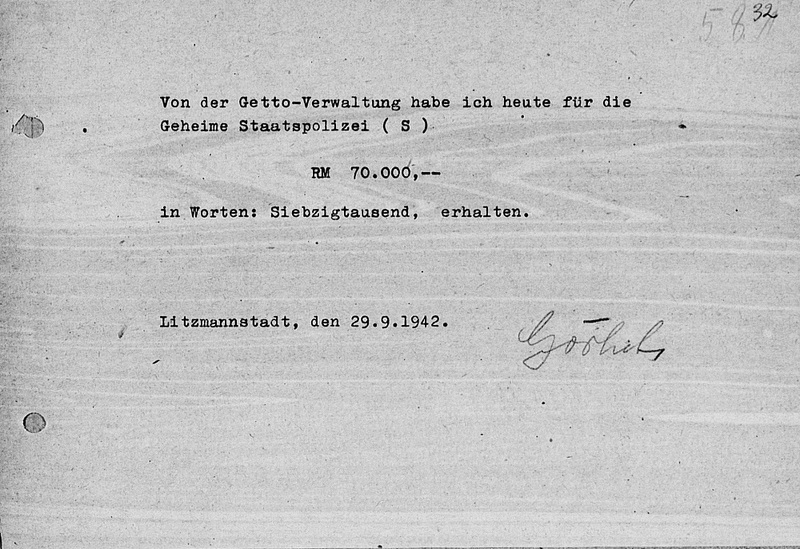 On 9 January 1942, when the killing of the Sinti and Roma of the Ghetto Litzmannstadt was completed,  the commandant Herbert Lange received a bar cheque for 20,000 RM from the Ghetto Administration "as special assignment for the gypsies' camp" (Document 105). 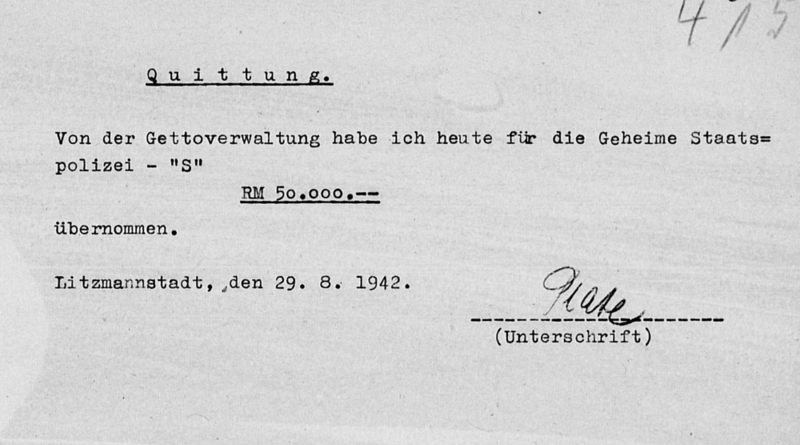 The payment may have been a danger bonus for the Sonderkommando men because of typhus cases among the Sinti and Roma. 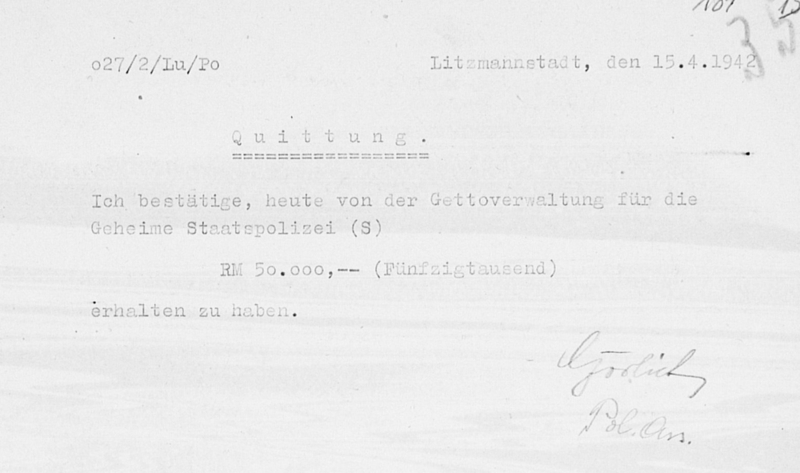 Apart from that, the extermination camp was apparently funded by the Provincial Government in Posen in this initial period of December - February 1942. 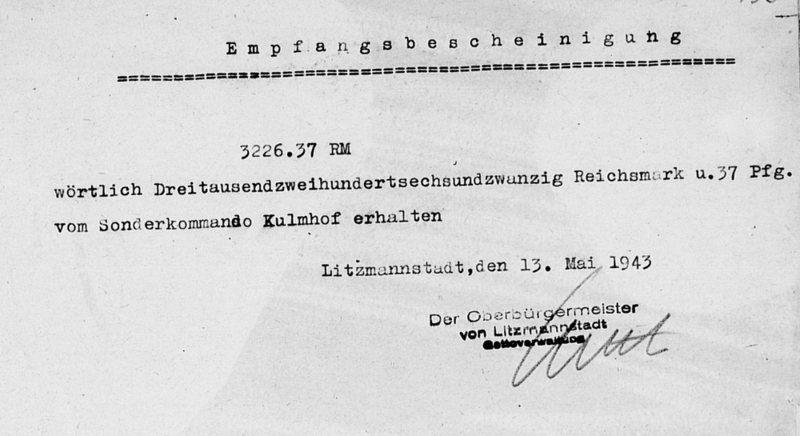 The cash confiscated in Kulmhof was delivered to Posen, as shown by the transfer of a "surplus of Sonderkommando Kulmhof" of about 176,000 RM in late April 1942 from the Reich Governor's office to the Litzmannstadt Ghetto Administration, which had been "accumulated at Sonderkommando Lange and [was] partly retained here" (Document 109). 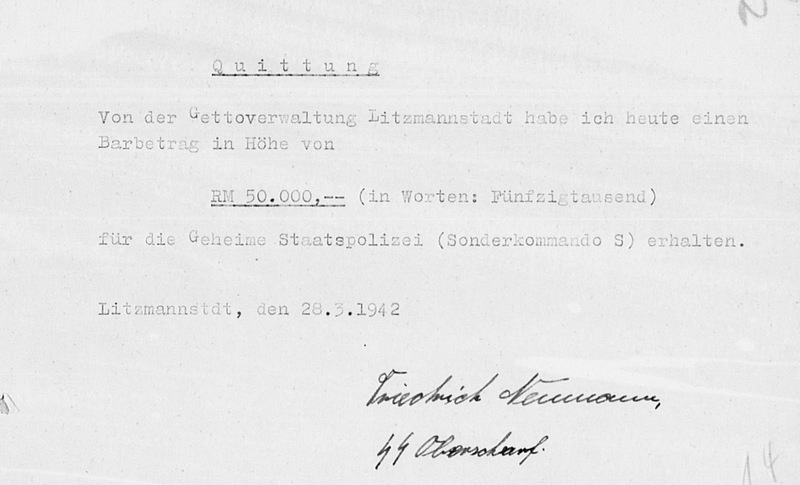 The transactions of the Sonderkommando were carried out with the postal cheque account 14551 of the "Landesversicherungsanstalt Wartheland" (State Insurance Institution) (Document 159). 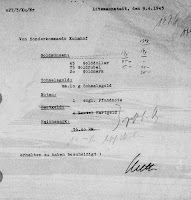 Such cover up account - possibly related to the Health Insurance Department of Landesversicherungsanstalt Wartheland - might have been a relict of camouflaging the Euthanasia operations of Sonderkommando Lange. 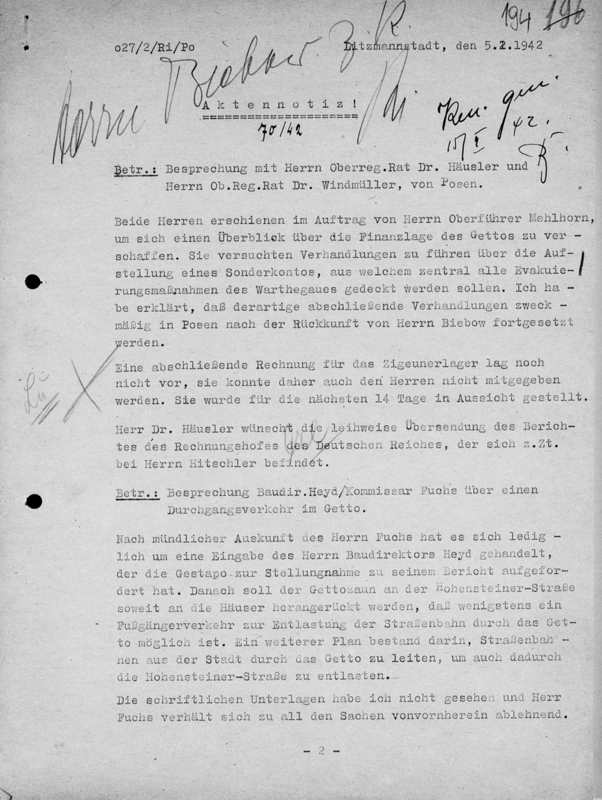 In February 1942, a new policy was adopted how to deal with the financial matters of the extermination of the Warthegau Jews. 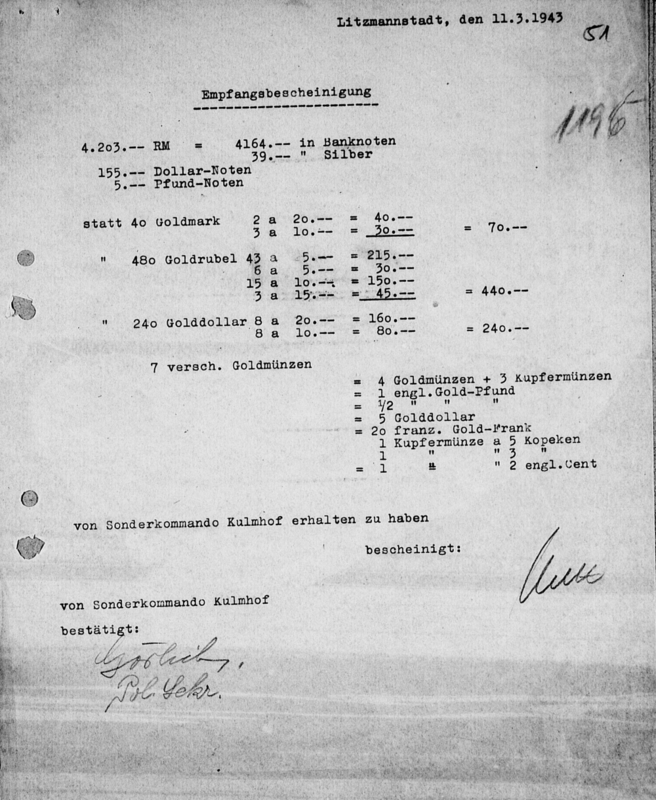 On 5 February, two officials from the Reichs Governor met with the Litzmannstadt Ghetto Administration "to negotiate the establishment of a special account, which should centrally cover all evacuation measures of the Warthegau" (Document 106). 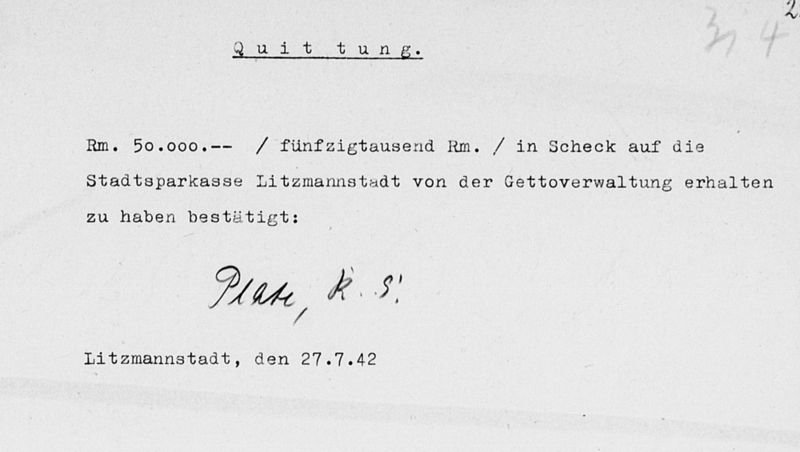 As a result, the Ghetto Administration opened "special account 12300" at the Sparkasse Litzmannstadt in late February 1942. The account's bank statements were kept as "secret state affair" in a safe (Document 108). The available records of the special account include - amongst other things - bills, payment vouchers, payment receipts, (incomplete) monthly account summaries (APL/221/29665 - 29678) and account statements (APL/221/29664 & 29679) for 1942 - 1943. 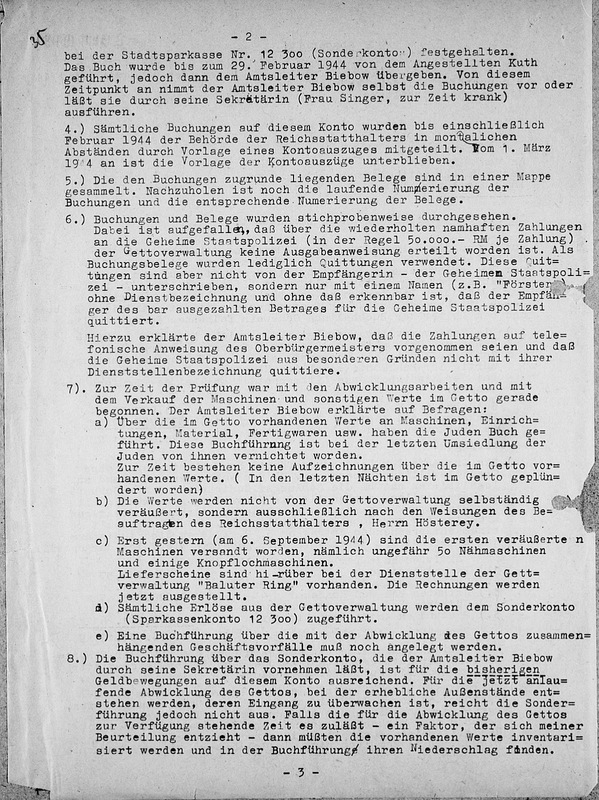 According to a decree of the provincial government of March 1942, "all assets such as money, foreign exchange, household goods, goods belonging to resettled Jews, go to the Ghetto Administration in Litzmannstadt" (Document 107). 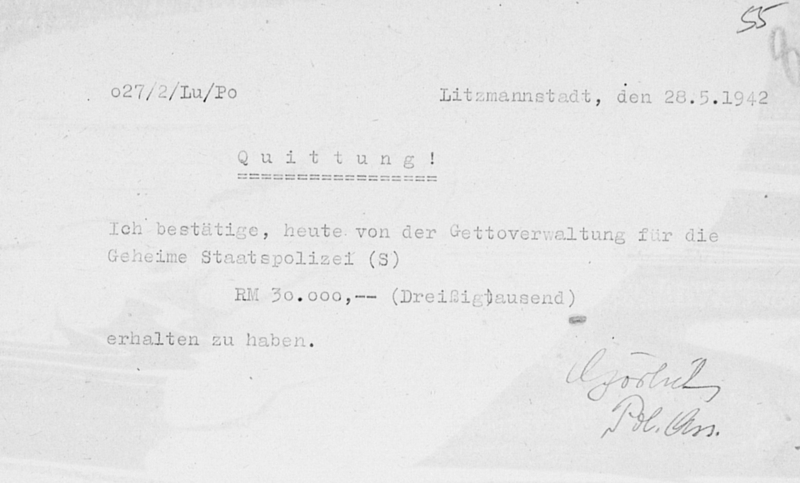 In turn, the Ghetto Administration had to pay for all expenses related to the extermination of the Jews - including the operation of Kulmhof extermination camp. 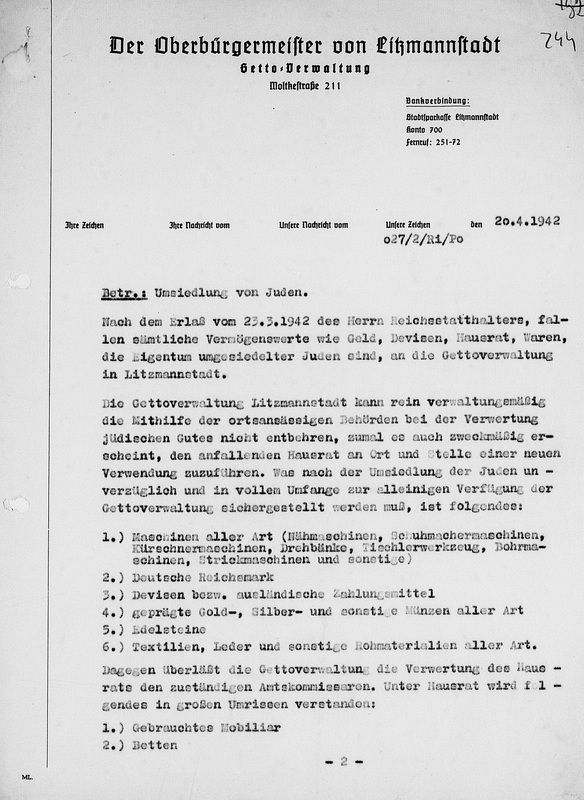 As the Litzmannstadt Ghetto Administration reminded other counties in April 1942, it was not permitted to take away money from the deported Jews as "collecting the cash is solely and exclusively the task of Sonderkommando Lange" (Document 107). 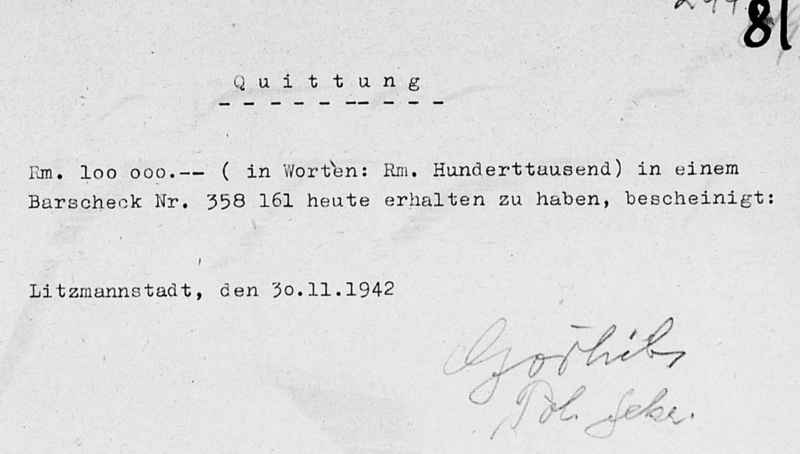 From 27 February 1942 until 13 May 1943, the bookkeeper,  or in his absence another member of the SS Sonderkommando, went to Litzmannstadt 25 times with cash ranging from 36 RM to 268,400 RM to be paid on the special account of the Ghetto Administration. 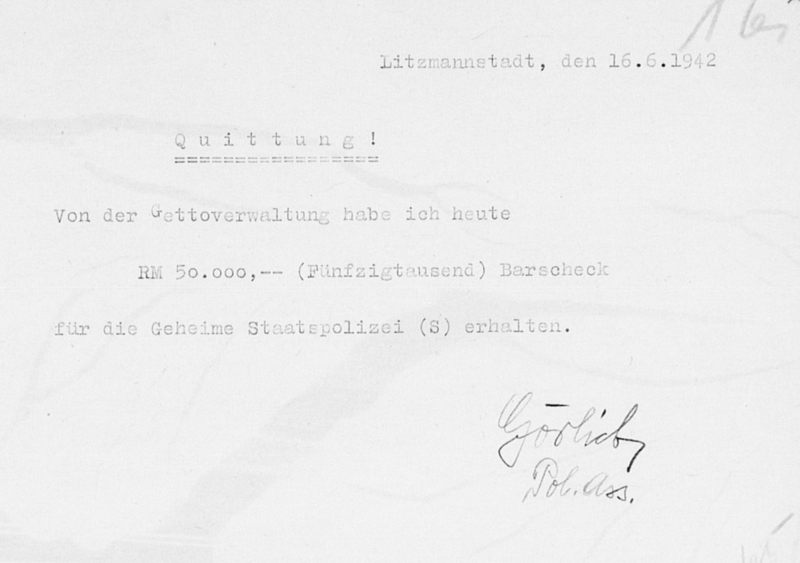 In one case, the head of the Ghetto Administration Hans Biebow picked up a sum of 58,300 RM directly in Kulmhof (Documents 110 - 135). 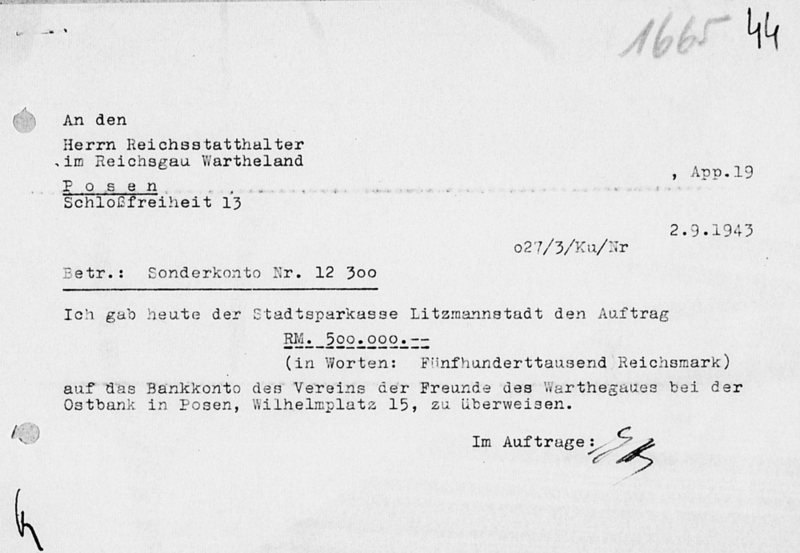 The cash deposited by the Sonderkommando at the Ghetto Administration and the "surplus of Sonderkommando Kulmhof" sent from Posen amounted to 2,660,000 RM. 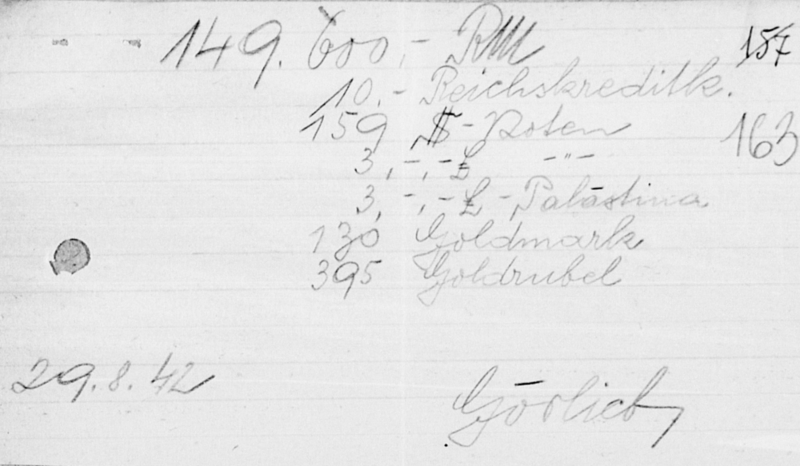 Another 1,140,000 RM cash was found among the confiscated property of the killed Jews in Pabianice. About 870,000 RM revenue were obtained from the "clearance sales" of the emptied ghettos. 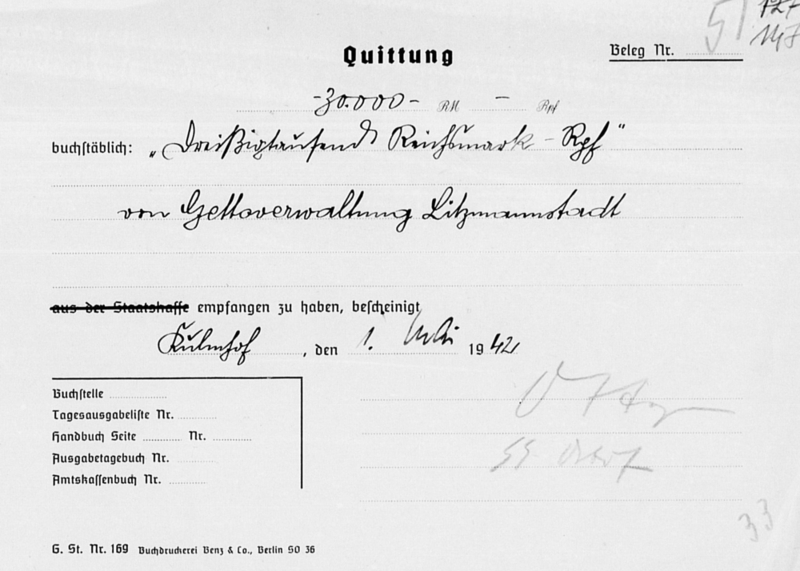 Further 1,140,000 RM were received for the special account until late April 1943 from 70% of the wages for the forced labour Jew working outside the Ghetto (0.7 RM per day per person). 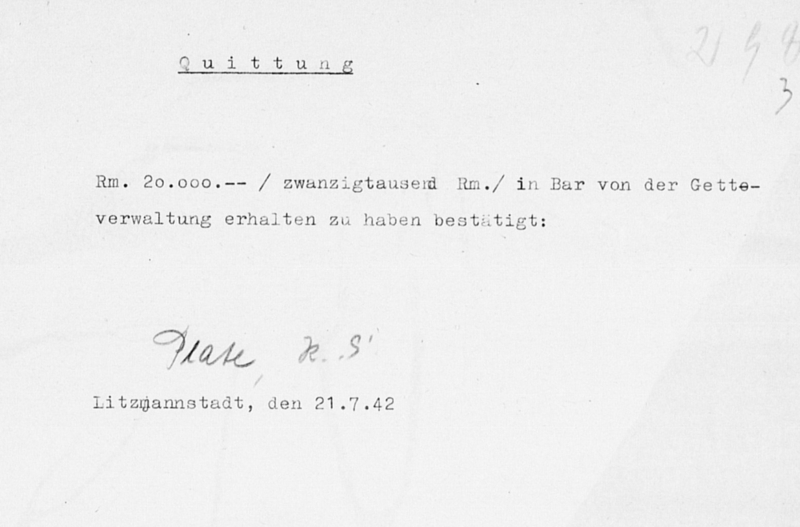 In total, almost 6 Million RM flowed on the special account 12300 up to the liquidation of the extermination camp. 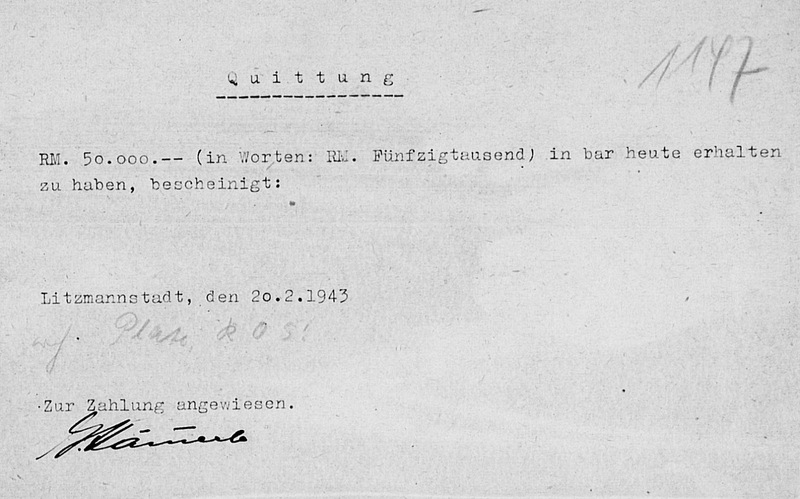 The cash in hand on the special account was used to fund the Kulmhof camp. 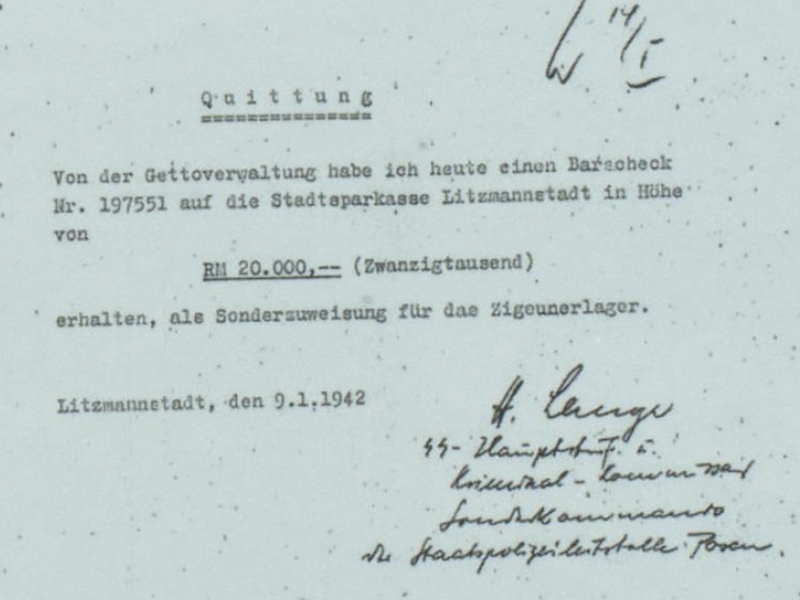 Between 28 February 1942 to 31 March 1943, members of the Sonderkommando showed up 22 times in Litzmannstadt to pick up bar cheques for 10,000 - 100,000 RM (usually 50,000 RM). 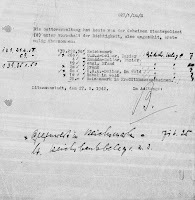 The cheques were received 11 times by Wilhelm Görlich, 6 times by the deputy commandant Albert Plate, each one time by Alfred Behm, Herbert Otto, Erwin Bürstinger, Friedrich Neumann and in one case the name of the recipient seems unreadable (Documents 136 - 157). 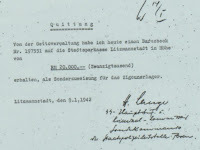 In September 1944, the obscure payments to the Sonderkommando caught the attention of a financial auditor of the Warthegau, who spot checked the books of the account. 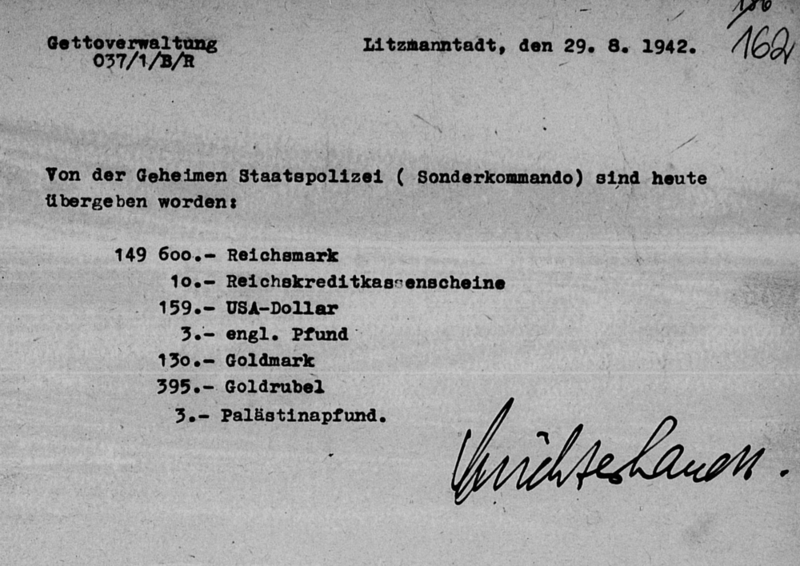 He complained about the "repeated, large payments" to the Gestapo without any payment order whatsoever and without official certification that the money was actually obtained by the Gestapo. 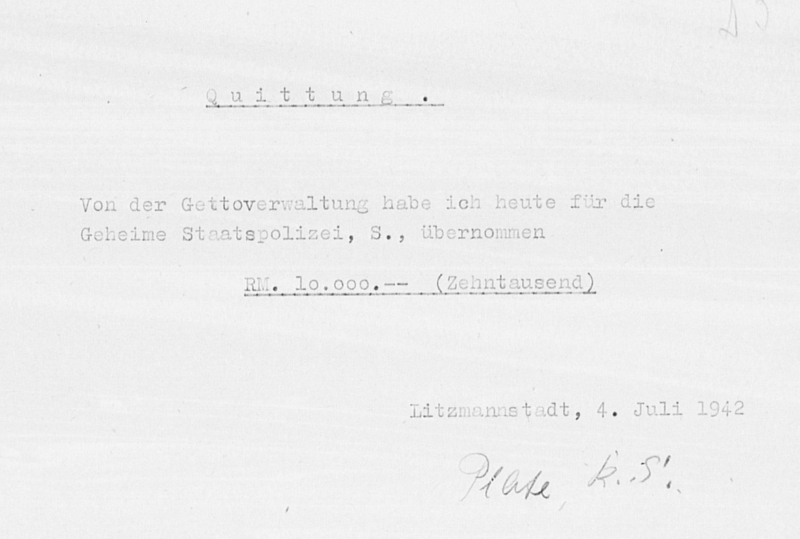 The head of the Ghetto Administration Hans Biebow explained the auditor that the payments were made at the oral order of the Lord Major and that the Gestapo did not certify the receipt of the money using its official title "for special reasons" (Document 160). 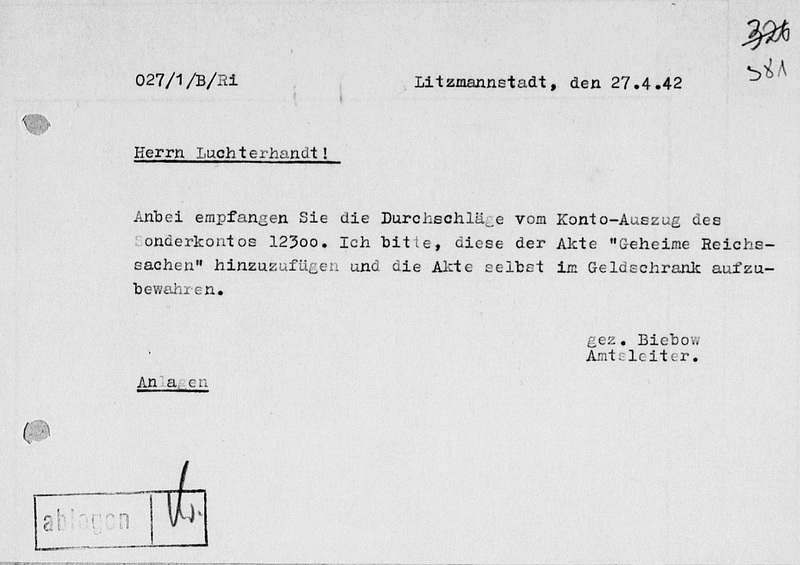 On 1 October 1944, Biebow talked to the Litzmannstadt police president Albert about the auditor's report. 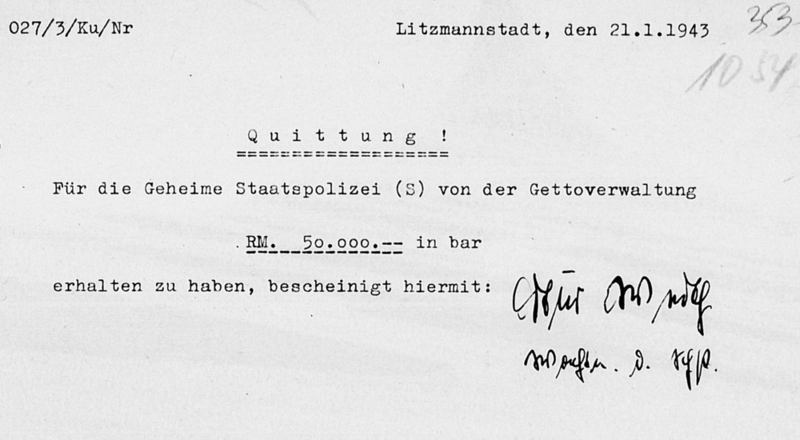 The conversation was tapped by Göring's security service in Litzmannstadt. Biebow remarked that "it should not be recognizable" who received the payments and that the men were from the "commandos". The Lord Major Bradfisch would "jump for joy" if he read the report. The police president argued one should just write it was a "secret state affair" (Document 161). 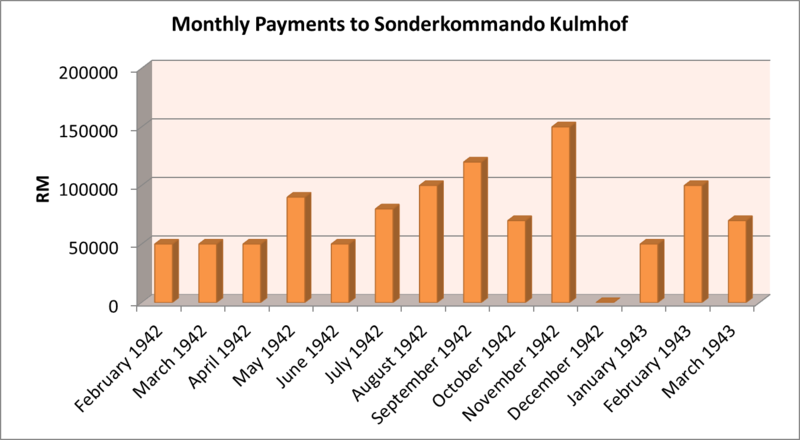 The total sum paid out to the Sonderkommando between February 1942 and March 1943 amounts to 1,030,000 RM (monthly breakdown in Figure 1). 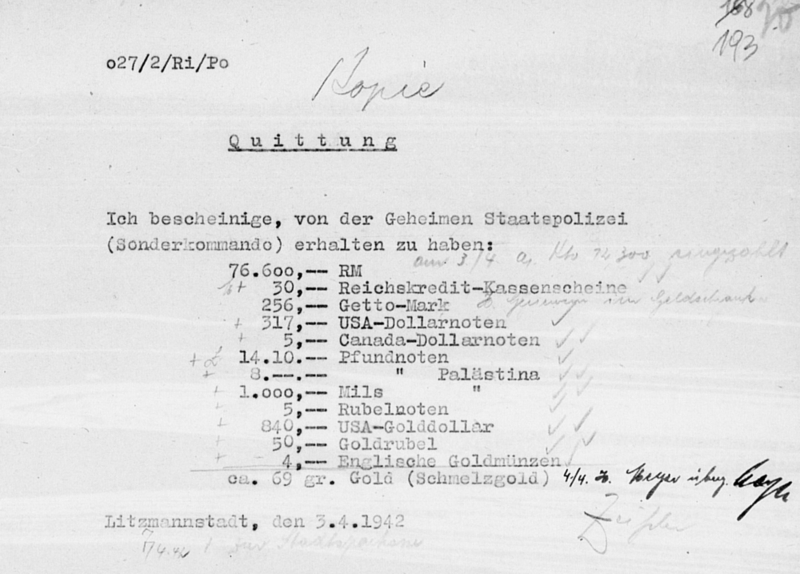 In the absence of any documentation of the accounting from the Sonderkommando itself, it is not entirely clear for what the money was spent in detail. Still, it is possible to infer and estimate some of the costs of the camp. 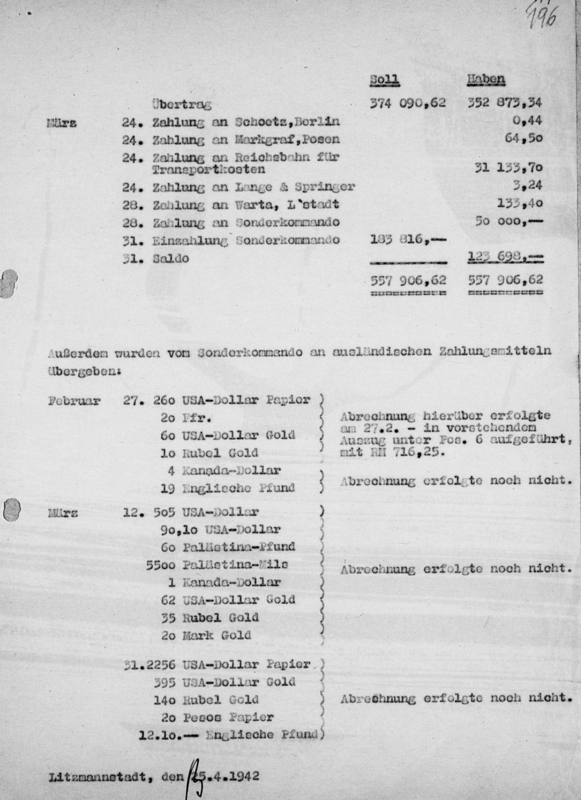 In March 1942, the Sonderkommando spent 50,000 RM, which can be considered the running costs of the extermination activity. 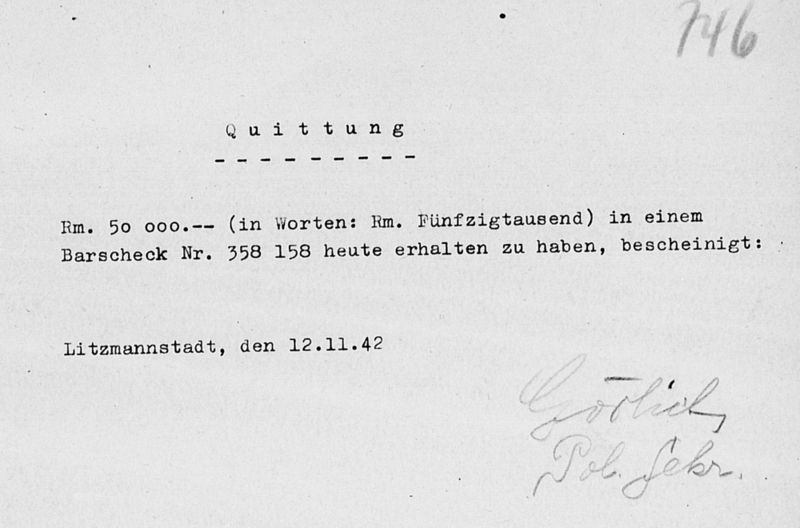 The SS and police members received a daily extra of 10 to 15 RM as danger bonus and hush money (Document 96 here). 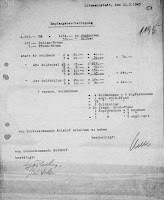 The daily benefit enabled the Sonderkommando police men Friedrich Maderholz to deposit 2800 RM on his bank account in Eichstädt (Dabie) near Kulmhof between late March 1942 and early October 1942 - corresponding to about 14 RM per day -, which was far exceeding his salary. 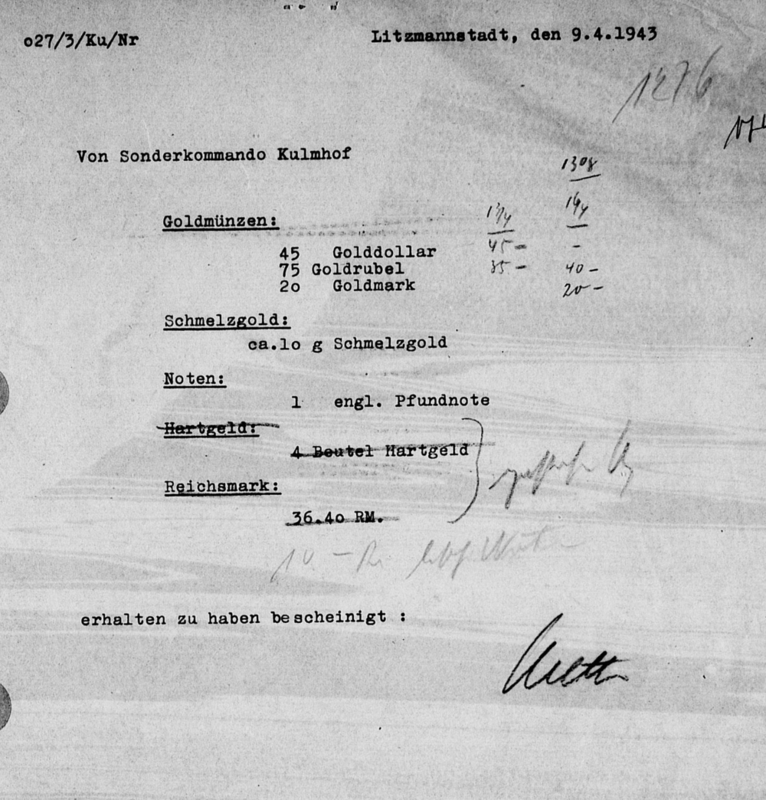 For 100 members of the Sonderkommando, about 35,000 RM of bonus had to be paid out per month. The monthly costs for leasing the motor pool, for purchasing the fuel and the food provisions can be each estimated to have been at the order of 5,000 RM. 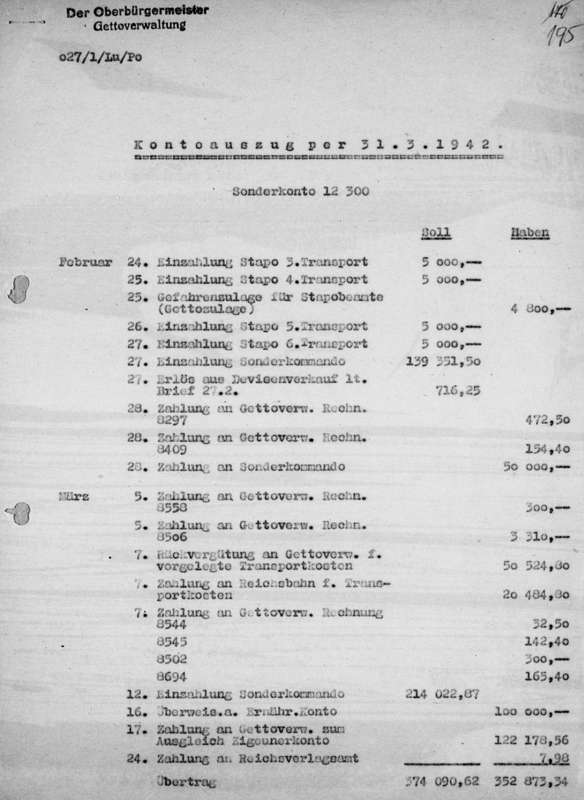 These costs already account for the Sonderkommando budget and the actual salary of the SS and police men had to be paid from their dispatching agencies (namely the Gestapo Posen, the Gestapo Litzmannstadt, the Umwandererzentralstelle and the police Litzmannstadt). 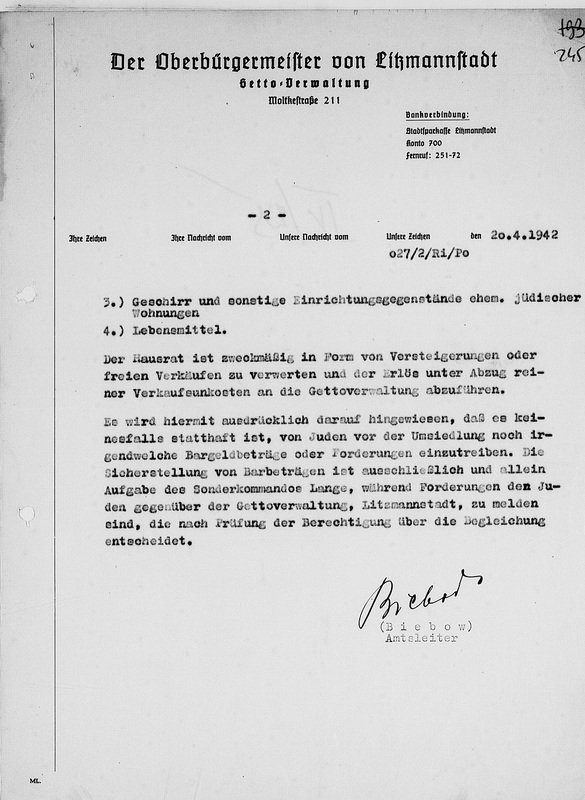 Since May 1942, an increase of the Sonderkommando budget is apparent, which is partly related to increasing transport costs to clear the effect storage sites but mostly to the body disposal activities in the forest camp. In the period July - December 1942, the Sonderkommando spent in average about 86,000 RM per month. 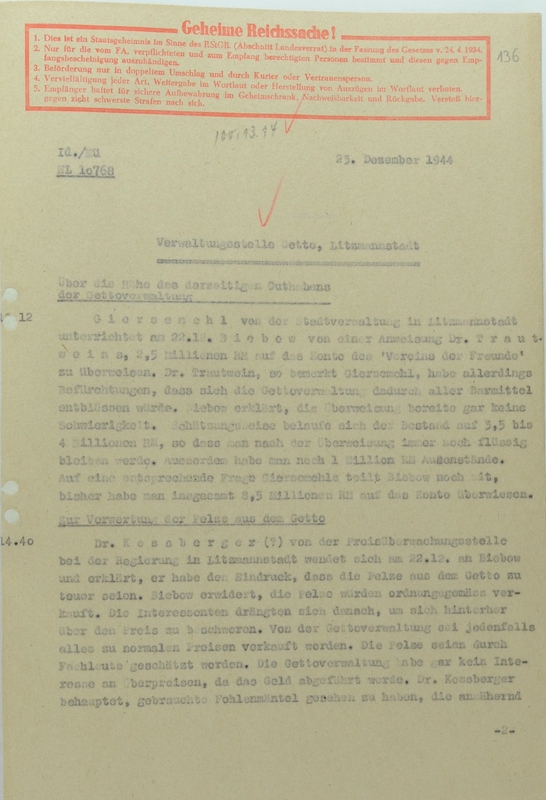 The additional costs included the supply of resources for the forest camp, which were not obtained from the Litzmannstadt Ghetto, like the excavator, the narrow gauge railway, bricks for the incineration furnaces, gasoline and fire wood, etc. but also provisions for the enlarged working detail. 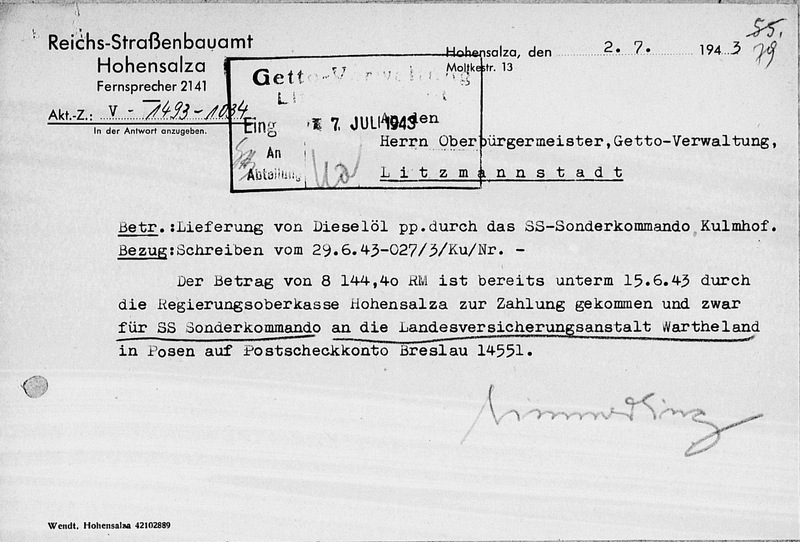 The Ghetto Administration Litzmannstadt further paid from the special account goods delivered for the extermination camp from the Ghetto, bills submitted by the Sonderkommando and the Gestapo Posen as well as bills submitted by the Gestapo Litzmannstadt after the Kulmhof camp was liquidated in April 1943. These payments have not been systematically calculated here, but may amount to few 10,000 RM. 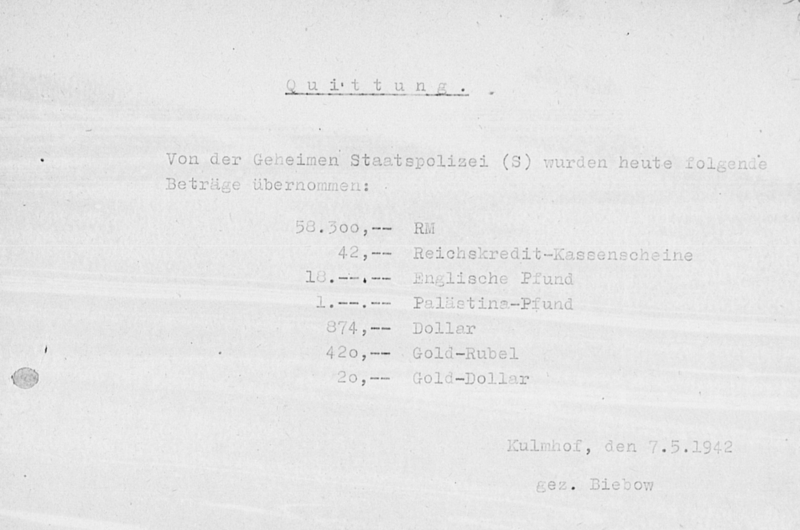 The major flows of money from and to the special account 12300 during the first period of Kulmhof extermination camp are summarised in Table 1. Besides funding the camp and its sorting site Pabianice, the account was used to pay deportation costs, to balance the so-called Gypsies account after the liquidation of the Sinti and Roma and to support the so called "food account" no. 700 of the Ghetto Litzmannstadt. 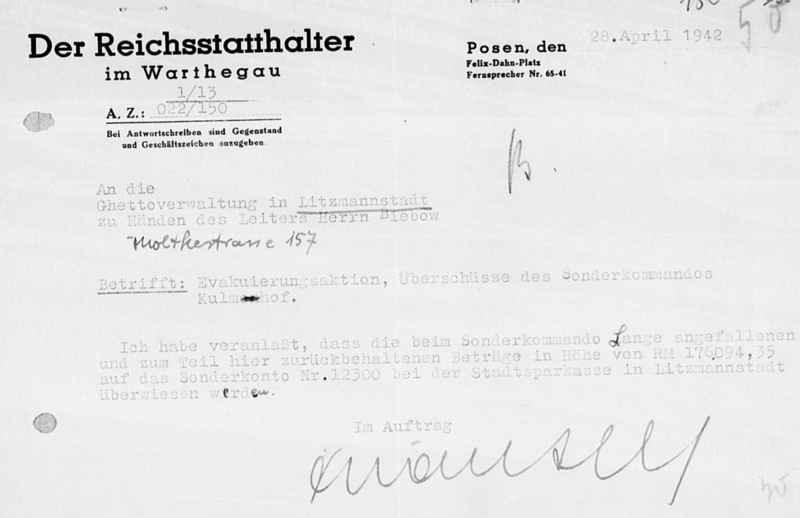 The remaining the revenue of the extermination of the Warthegau Jews was transferred to a bank account in Posen called "Association of Friends of the Warthegau". 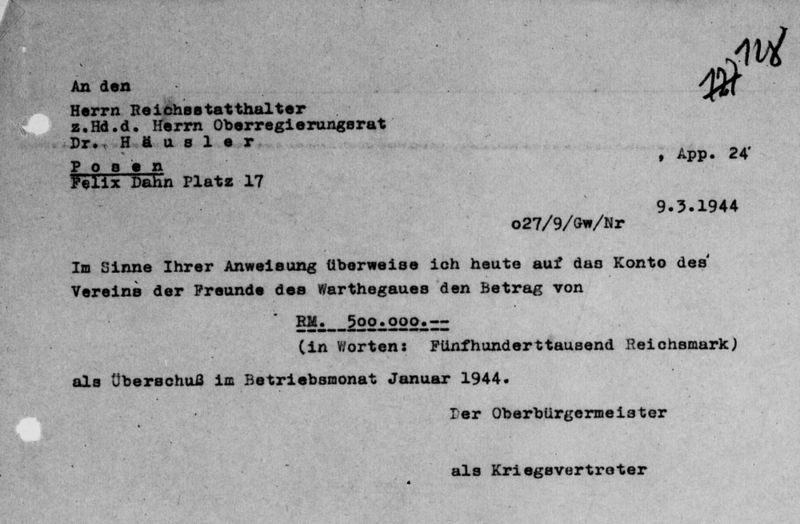 By order of the Gauleiter Arthur Greiser, 4 Million RM were deposited on this black account on 25 February 1943 (Documents 158). TABLE 1: Sum of the major transactions of special account 12300 in the period 27 February 1942 - 30 April 1943. 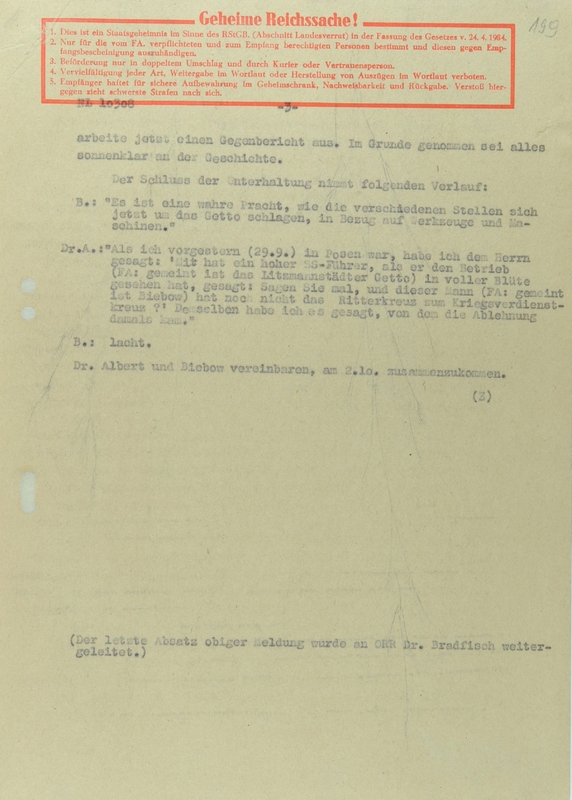 After the Kulmhof camp ceased to exist in April 1943, the special account continued to receive its 70% part of the wages for forced labour Jews outside the Ghetto. Greiser ordered the money to be sent to his black bank account once exceeding 500,000 RM. 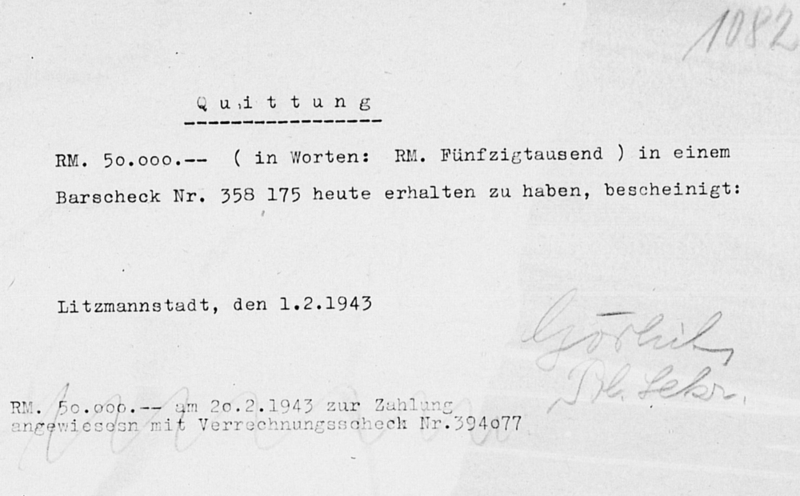 In September 1943 and March 1944, each 500,000 RM were transferred to the account of the "Association of Friends of the Warthegau" (Documents 158). cf. 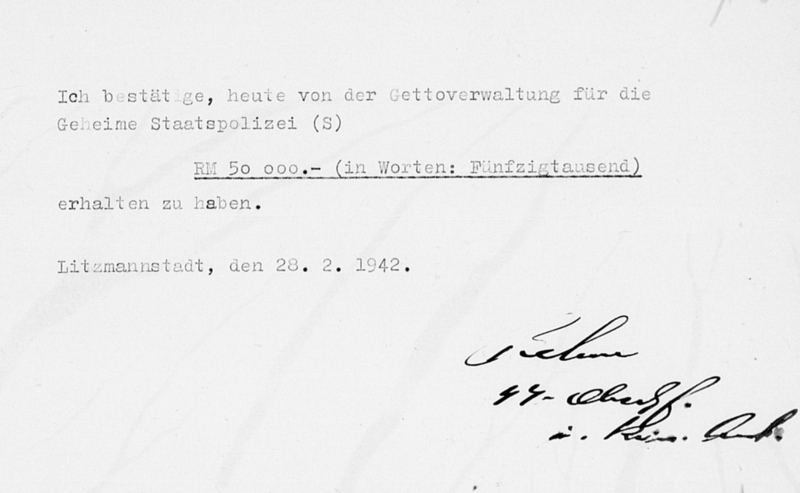 Klein, Die Gettoverwaltung Litzmannstadt, p. 503f. erhalten, als Sonderzuweisung für das Zigeunerlager. as special assignment for the gypsies' camp. Betr. : Besprechung mit Herrn Oberreg.Rat Dr.Häusler und Herrn Ob.Reg.Rat. Dr. Windmüller, von Posen. Beide Herren erschienen im Auftrag von Herrn Oberführer Mehlhorn, um sich einen Überblick über die Finanzlage des Gettos zu verschaffen. Sie versuchten Verhandlungen zu führen über die Aufstellung eines Sonderkontos, aus welchem Zentral alle Evakuierungsmaßnahmen des Warthegaues gedeckt werden sollen. Ich habe erklärt, daß derartige abschließende Verhandlungen zweckmäßig in Posen nach der Rückkunft von Herrn Biebow fortgesetzt werden. Subject: Meeting with Mr. Oberreg.Rat Dr.Häusler and Mr. Herrn Ob.Reg.Rat. Dr. Windmüller, from Posen. 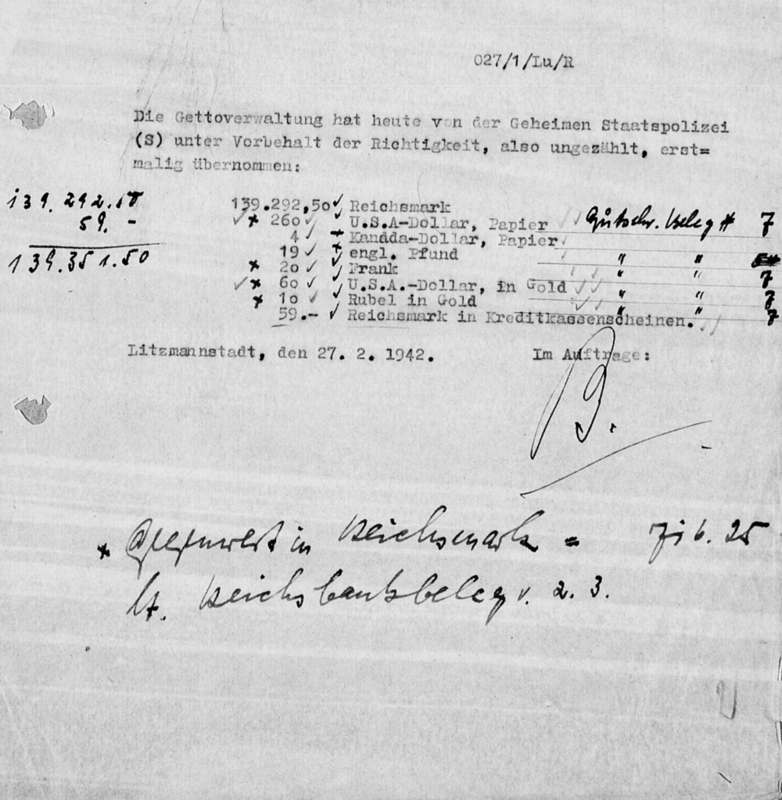 Both gentlemen appeared on behalf of Mr. Oberführer Mehlhorn to get an overview of the financial situation of the ghetto. 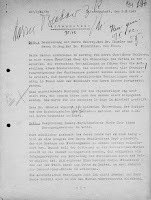 They tried to negotiate the establishment of a special account, which should centrally cover all evacuation measures of the Warthegau. I explained that the final negotiations will be continued in Posen after Mr. Biebow's return. 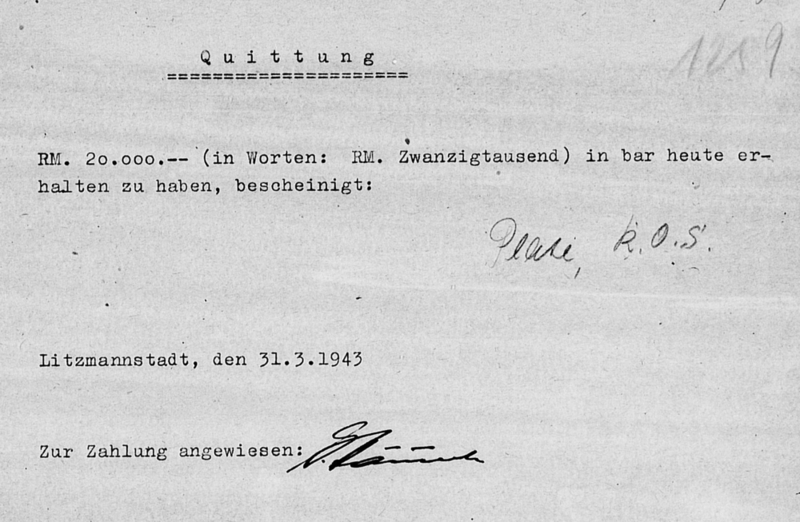 Nach dem Erlass vom 23.3.1942 des Herrn Reichsstatthalters, fallen sämtliche Vermögenswerte wie Geld, Devisen, Hausrat, Waren, die Eigentum umgesiedelter Juden sind, an die Gettoverwaltung in Litzmannstadt. 6.) Textilien, Leder und sonstige Rohmaterialien aller Art. Der Hausrat ist zweckmäßig in Form von Versteigerungen oder freien Verkäufen zu verwerten und der Erlös unter Abzug reiner Verkaufsunkosten an die Gettoverwaltung abzuführen. Es wird hiermit ausdrücklich darauf hingewiesen, dass es keinesfalls statthaft ist, von Juden vor der Umsiedlung noch irgendwelche Bargeldbeträge oder Forderungen einzutreiben. Die Sicherstellung von Barbeträgen ist ausschliesslich und allein Aufgabe des Sonderkommandos Lange, während Forderungen den Juden gegenüber der Gettoverwaltung, Litzmannstadt, zu melden sind, die nach Prüfung der Berechtigung über die Begleichung entscheidet. 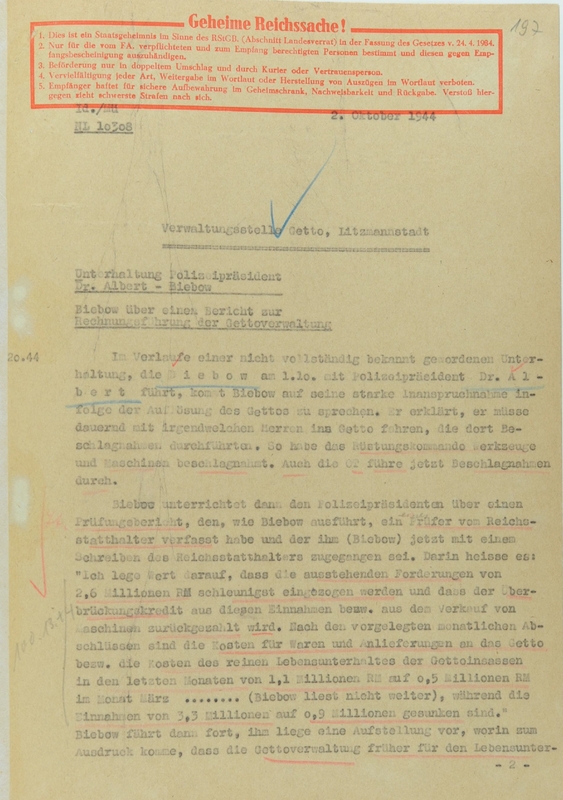 According to the decree of 23 March 1942 of Mr. Reichsstatthalters, all assets such as money, foreign exchange, household goods, goods belonging to resettled Jews, go to the Ghetto Administration in Litzmannstadt. 6.) Textiles, leather and other raw materials of all kinds. The household effects should be sold in the form of auctions or free sales, and the revenue shall paid to the Ghetto Administration after subtracting the pure selling expenses. 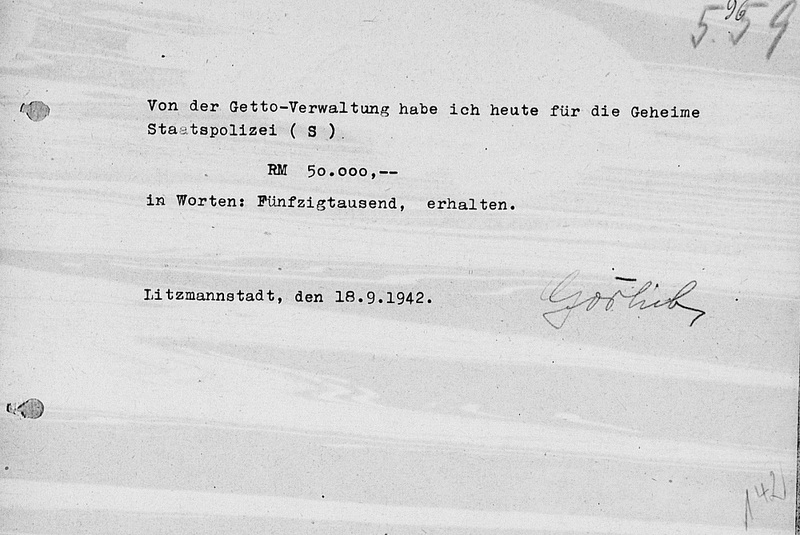 It is hereby emphasised that it is by no means allowed to collect any cash or claims of Jews before the resettlement. 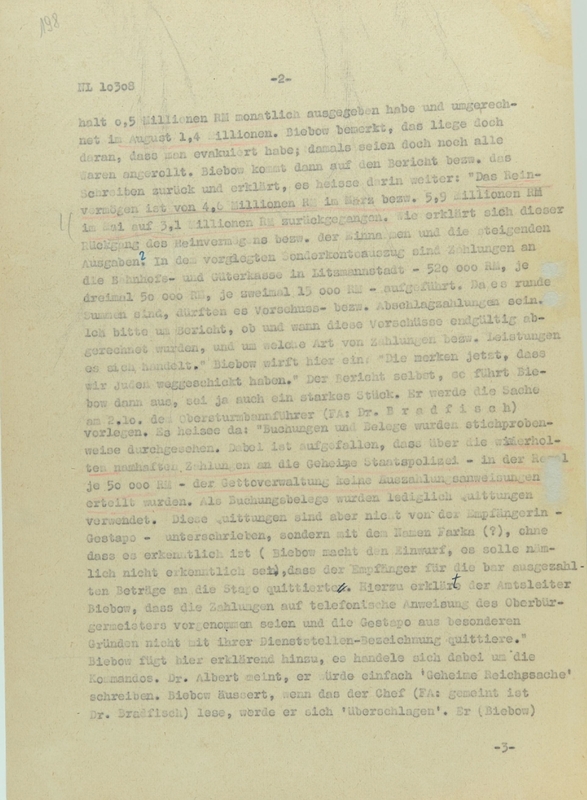 Collecting the cash is solely and exclusively the task of Sonderkommando Lange, while demands towards the Jews are to be reported to the Ghetto Admnistration Litzmannstadt, which decides on the settlement after examining its correctness. Anbei empfangen Sie die Durchschläge vom Konto-Auszug des Sonderkontos 12300. Ich bitte, diese der Akte "Geheime Reichssache" hinzuzufügen und die Akte selbst im Geldschrank aufzubewahren. Enclosed you receive the copies of the bank statements of the special account 12300. I ask you to add this to the file "Secret State Affair" and keep the file in the safe. Ich habe veranlasst, dass die beim Sonderkommando Lange angefallenen und zum Teil hier zurückbehaltenen Beträge in Höhe von RM 176.094,35 auf das Sonderkonto Nr. 12300 bei der Stadtsparkasse in Litzmannstadt überwiesen werden. In the case of reply letters the subject matter and reference number are to be given. I have prompted that the amounts accumulated at the Sonderkommando Lange and partly retained here amounting to RM 176,094.35 are transferred to the special account no. 12300 at the Stadtsparkasse in Litzmannstadt. Bezeichnungen Umsätze Neuer Saldo Konto Nr. 28. Zahlung an Gettoverw. Rechn. Abrechnung hierüber erfolgte am 27.2 - in vorstehendem Auszug unter Pos. 6 aufgeführt, mit RM 716,25. 59.- Reichsmark in credit bank notes. description transactions new balance account no. Settlement was made on 27.2 - in the above extract item 6 - with RM 716.25. Betr. : Lieferung von Dieselöl pp. 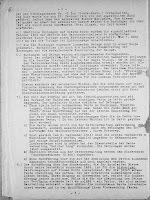 durch das SS-Sonderkommando Kulmhof. 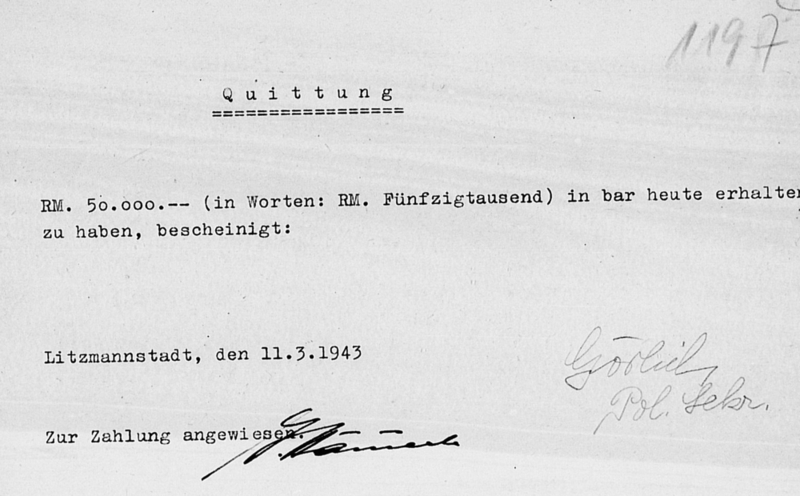 Der Betrag von 8 144,40 RM ist bereits unterm 15.6.43 durch die Regierungsoberkasse Hohensalza zur Zahlung gekommen und zwar für das SS Sonderkommando an die Landesversicherungsanstalt Wartheland in Posen auf das Postscheckkonto Breslau 14551. 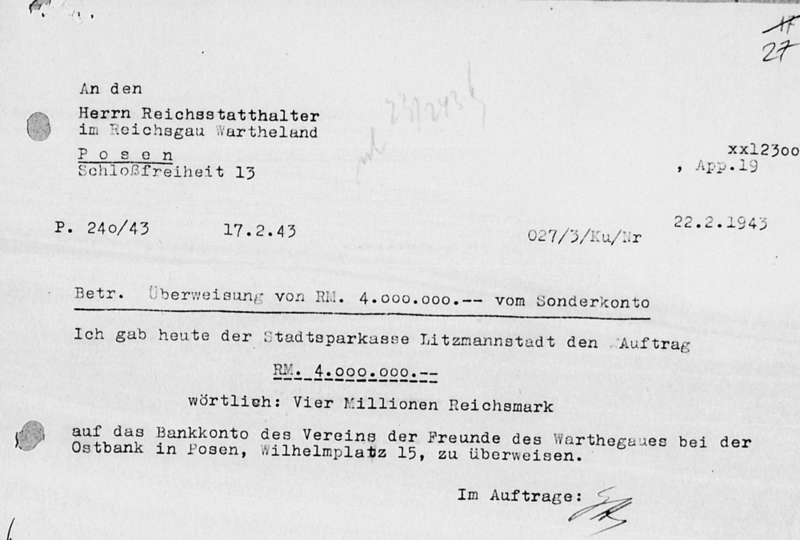 The amount of 8,144.40 RM has already been paid by the Government Account Hohensalza on 15.6.43, namely for the SS Sonderkommando to the state insurance institution Wartheland in Posen on the postal cheque account Breslau 14551. 6.) Buchungen und Belege wurden stichprobenartig durchgesehen. Dabei ist aufgefallen, daß über die wiederholten namhaften Zahlungen an die Geheime Staatspolizei (in der Regel 50.000.- RM je Zahlung) der Gettoverwaltung keine Ausgabeanweisung erteilt worden ist. Als Buchungsbelege wurden lediglich Quittungen verwendet. Diese Quittungn sind aber nicht von der Empfängerin - der Geheimen Staatspolizei - unterschrieben, sondern nur mit einem Namen (z.B. "Förster") ohne Dienstbezeichnung und ohne daß erkennbar ist, daß der Empfänger des bar ausgezahlten Betrages für die Geheime Staatspolizei quittiert. Hierzu erklärt der Amtsleiter Biebow, daß die Zahlungen auf telefonische Anweisung des Oberbürgermeisters vorgenommen seien und daß die Geheime Staatspolizei aus besonderen Gründen nicht mit ihrer Dienststellenbezeichnung quittiere. 6.) Bookings and receipts were checked by sampling. 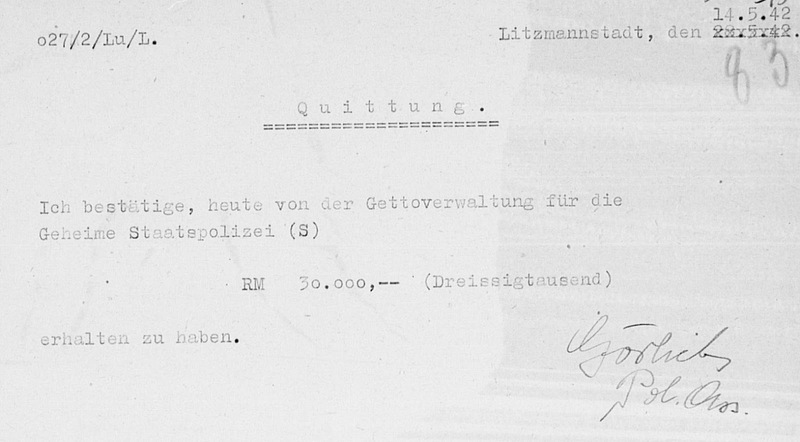 It is noticed that no payment orders were given to the Ghetto Administration for repeated, large payments to the Secret State Police (usually 50,000.- RM per payment). Only receipts were used as posting documents. 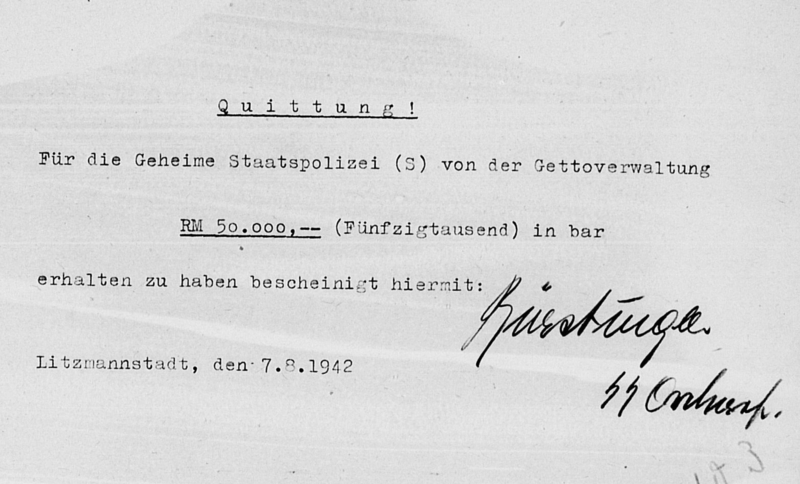 These receipts, however, are not signed by the recipient - the Secret State Police, but only with a name (for example, "Förster") without official title and without being recognizable that the receiver of the cash accepted the receipts for the Secret State Police. Biebow, the head of the office, explained that the payments were made at the order of the Lord Mayor by phone, and that the Secret State Police did not accept the receipts with their office title for special reasons. "Buchungen und Belege wurden stichprobenweise durchgesehen. Dabei ist aufgefallen, dass über die wiederholten namenhaften Zahlungen an die Geheime Staatspolizei - in der Regel je 50 000 RM - die Gettoverwaltung keine Auszahlungsanweisungen erteilt wurden. Als Buchungsbelege wurden lediglich Quittungen verwendet. Diese Quittungen sind aber nicht von der Empfängerin - Gestapo - unterschrieben, sondern mit dem Namen Farka (? ), ohne dass es erkenntlich ist (Biebow macht den Einwurf, es solle nämlich nicht erkenntlich sein), dass der Empfänger für die bar ausgezahlten Beträge an die Stapo quittierte. Hierzu erklärte der Amtsleiter Biebow, dass die Zahlungen auf telefonische Anweisung des Oberbürgermeisters vorgenommen seien und die Gestapo aus besonderen Gründen nicht mit ihrer Dienststelle-Bezeichnung quittierte." Biebow fügt hier erklärend hinzu, es handele sich dabei um die Kommandos. Dr. Albert meint, er würde einfach 'Geheime Reichssache' schreiben. Biebow äussert, wenn das der Chef (FA: gemeint ist Dr. Bradfisch) lese, werde er sich 'überschlagen'. Er (Biebow) arbeite jetzt einen Gegenbericht aus. Im Grunde genommen sei alles sonnenklar an der Geschichte. "Bookings and receipts were checked by sampling. It is noticed that no payment orders were given to the Ghetto Administration for repeated, large payments - usually 50,000.- RM per payment - to the Secret State Police. Only receipts were used as posting documents. These receipts, however, are not signed by the recipient - the Secret State Police, but only with the name Farka (?) without being recognizable (Biebow objects it should not be recognizable) that the receiver of the cash accepted the receipts for the Stapo. Biebow, the head of the office, explained that the payments were made at the order of the Lord Mayor by phone, and that the Secret State Police did not accept the receipts with their office title for special reasons." Biebow adds that these are the commandos. Dr. Albert thinks one should just write 'Secret State Affair'. Biebow says if the boss (FA: Dr. Bradfisch is meant) reads this, he would 'jump for joy'. He (Biebow) is now working out a counter-report. Basically, everything is crystal clear with this affair. 1?.12 Giersemehl von der Stadtverwaltung in Litzmannstadt unterrichtet am 22.12. Biebow von einer Anweisug über Dr. Trautweins, 2,5 Millionen RM auf das Konto des 'Vereins der Freunde' zu überweisen. Dr. Trautwein, so bemerkt Giersemehl, habe allerdings Befürchtungen, dass sich die Gettoverwaltung dadurch aller Barmittel entblössen würde, Biebow erklärt, die Überweisung bereits gar keine Schwierigkeit. Schätzungsweise belaufe sich der Bestand auf 3,5 bis 4 Millionen RM, so dass man nach der Überweisung immer noch flüssig bleiben werde. Ausserdem habe man noch 1 Million RM Außenstände. Auf eine entsprechende Frage Giersemehls teilt Biebow noch mit, bisher habe man insgesamt 8,5 Millionen RM auf das Konto überweisen. 1?.12 Giersemehl from the city administration in Litzmannstadt informs Biebow about an order from Dr. Trautwein to transfer 2.5 Million RM to the account 'Association of the Friends'. 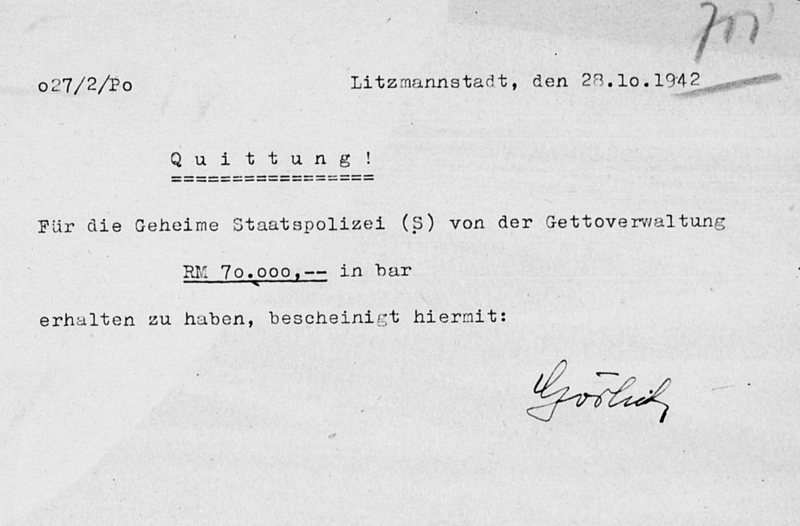 According to Giersemehl, Dr. Trautwein fears that the ghetto administration would thereby lose all cash. Biebow declares that the transfer is no difficulty. It is estimated that the reserves amount to 3.5 to 4 million RM, so that one would still remain liquid after the transfer. In addition, one has 1 million RM outstanding debts. On Giersemehl's question, Biebow states that they have already paid a total of 8.5 million RM to the account.